An oil painting on canvas c 1855 clearly showing the buildings in Millbank Street where the Goldsmith family lived from around 1880. 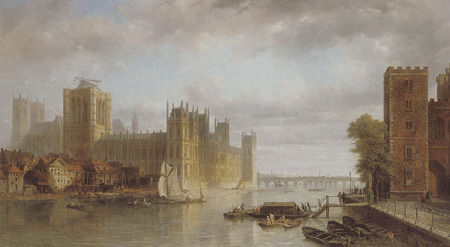 The clock tower and Victoria Tower were still being built at the time of the painting. In the mid 1800's the River Thames was in such an abominable condition that they were obliged to close the windows of the Houses of Parliament because of the stench and there was talk of Parliament having to shift to other quarters altogether. The drains of London were pouring down their filth into the river at low water. Cholera, typhus, smallpox, and other water born diseases had carried off tens of thousands of citizens. By 1889 Sir Joseph Bazalgette had completed his mammouth task in building the new London Sewage system in Portland cement. He also reclaimed land to build the Victoria, Albert and Chelsea Embankments. Goldsmiths who possibly are connected to our family ran a newspaper shop in Peckham South London. Has anyone any information regarding this branch of the family ? 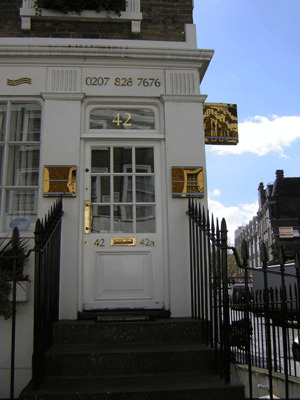 Charles Leonard Goldsmith ran a shop at 28a Ponsonby Place. The family lived next door at no 30. Charles knocked a hole through the wall when he had the lease so that the family could pass from shop to living quarters. Later Charles George took over the business and sold sweets and confectionary but after a few years it was not viable as many of the other shops in the area began selling sweets. no 69 other family members at various numbers. The early 19th century terraced housing around Ponsonby Place was developed around the Penitentiary and the influence of this vast complex is still evident in the layout of the properties. These were built by Thomas Cubitt as part of his speculative development of Pimlico and formed the easternmost point of his extensive master planning of the area. The grander properties front Millbank and are finished in stucco. The site of the former penitentiary was developed over the course of fewer than 20 years (beginning with the demolition of the penitentiary in 1890  To the east the site was developed for institutional and military uses providing a fine collection of buildings with the Tate Gallery forming the centrepiece. The Tate Gallery, now known as Tate Britain, was built as gallery dedicated to British Art and houses a fine collection of British art dating from 1500 to the present day. To the north of the Tate, a group of buildings was constructed to form the Queen Alexandra Military Hospital and on the south side the Royal Army Medical College was developed, providing accommodation for the Commandant, an officers mess, married quarters and a barracks block. CHARACTER OF THE CONSERVATION AREA GENERAL The Millbank Conservation area is made up of four distinct character areas. Within the boundary of the former Millbank Penitentiary is the group to the east formed by Tate Britain, The Royal Army Medical College and Queen Alexandra Military Hospital, and to the west the Millbank Estate. Together these provide a high concentration of listed buildings. To the south are the 19thcentury residential terraces of Ponsonby Place and Ponsonby Terrace. Finally the area includes part of the Millbank Embankment and a larger stretch of the River Thames. Nos 3 and 5 Ponsonby Terrace today. Lawrence Goldsmith and his wife Ellen lived here in rented rooms at least until 1937 when they disappered from the electoral role. The couple had ten children. The two houses appear to have been converted into one large complex even today. Their address fluctuated between nos 3 or 5 over the years. It was just round the corner from the rest of the family in Ponsonby Place. No 12 Wood Street today where William, Lawrence, Charles and Thomas Goldsmith lodged with the Poulters in 1901. 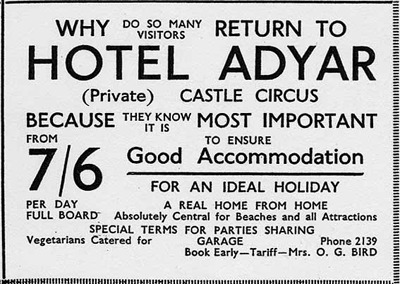 Two hotel/guest houses run by Gertrude and Harry Bird together with Dorothy.